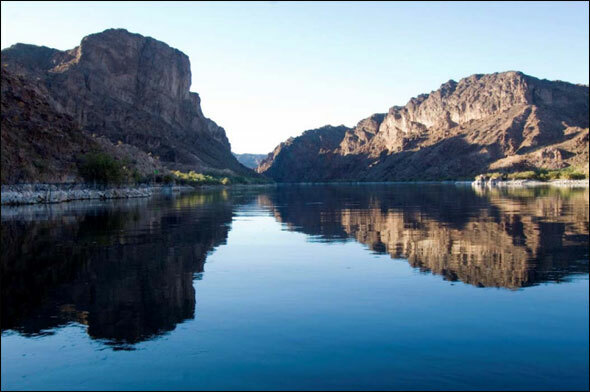 The interim report is the first step in a two-year evaluation of the Colorado River Basin. Photo courtesy Bureau of Reclamation. The mean annual flow from the upper basin of the Colorado River will decrease 9 percent by mid-century, according to one water supply projection from an interim report released Monday by the U.S. Bureau of Reclamation. Under that scenario—which was modeled using global climate data—the mean annual flow at Lees Ferry, Arizona, the dividing point between the upper and lower basin, would average 16.8 billion cubic meters (13.6 million acre-feet) over the next 50 years. Since record-keeping began in 1906, the observed flow has been 18.5 billion cubic meters (15 million acre-feet). But the long-term threat has a more immediate form: average water use in the basin already exceeds the average supply, and more water has been promised to users than will be available. It is a serious problem that Reclamation and other water agencies describe as an “imbalance,” just like a checking account has an imbalance when more money is spent than earned and the individual is on a fixed income. Monday’s document is the first of three interim reports that will precede a final report to be published in July 2012. The purpose of the study—a joint project between the seven basin states and the Bureau of Reclamation—is to describe water supply and demand scenarios in the Colorado River Basin through 2060 and to analyze strategies to meet future water needs. The basin supports more than 30 million people and irrigates a $US 3 billion agricultural industry. Dams in the basin, including the Hoover Dam, are a key source of base-load power for much of the Southwest. Terry Fulp, Reclamation’s project manager for the study, told Circle of Blue that “there were no surprises” in the results of the supply assessment. Studies using different climate models have shown larger decreases in the mean annual runoff, but the results of this latest study are consistent with a Department of the Interior report that was released in March and quantified climate change effects for eight major river basins in the West. Three of the supply models for this report used combinations of observed hydrological data and historical reconstructions. They showed future conditions hewing relatively close to past conditions in terms of runoff, but with longer dry periods. The fourth model used a down-scaled global projection that takes climate change into account. This made the water supply situation more complex: river runoff would peak earlier in the year, prolonged wet periods would almost disappear, and the occurrence of droughts that last longer than five years would happen 40 percent of the time, resulting in larger water deficits. Under this model, blessings could also turn into curses. High river flows—when they come—would be more intense, increasing the risk of floods and landslides. But the supply situation is a familiar tale, told by many scientists and policy wonks. The more interesting piece of the Reclamation study will come with the demand assessments section and the evaluations for how to close the gap. The latter will address efficiency and conservation, agriculture-to-urban water transfers, and augmentation options that range from respected (desalination) to controversial (pipelines from northern Nevada, or even the Mississippi River) to fanciful (icebergs). To revisit the checking account analogy, think of augmentation as a second job, except the only opening is once-a-week and low-paying.